It’s a Food Schmooze® holiday road trip! 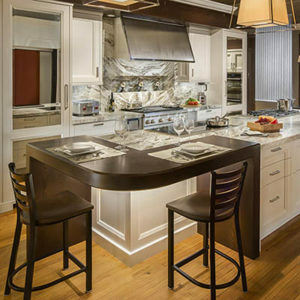 This week, we got in our cars and headed to the Clarke Kitchen and Design Showroom in South Norwalk, CT, where we learned you can “test drive” all of their kitchens and top-of-the-line appliances. 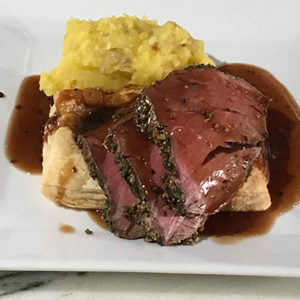 While we were there—in kitchen heaven—we made a showstopper of a holiday meal: Provençal Herb-Crusted Beef Tenderloin on top of Puff Pastry with a Red Wine Sauce. Sounds decadent, right? But, it’s totally do-able. Four simple steps, and everything can be made ahead. A Christmas miracle! We test the science behind convection oven cooking by baking Dorie Greenspan’s Christmas Spice Cookies and nibble on them while wine experts Alex Province and Mark Raymond reveal their picks for the best wines to drink and give this holiday season. Finally, Faith tours Clarke’s showroom and talks kitchen design with Marco Barallon. Design geeks, you’ll love hearing about what’s happening in the kitchen world right now. Never mind hanging your art on the fridge. The fridge is art. I am curious to know if the beef tenderloin recipe, as is, would work with pork. My family does not eat beef. Thank you! Hi Jackie: You’ve got the “all clear” from Chris. He said the rub would be delicious with pork as well. . .the sauce too! Let us know what you think after you make it. Thanks for listening!